The sparrow has got to be one of the places with the most buzz. I have gotten emails about it as well as read various forum postings raving about this place. Unfortunately, I’m slow to getting around to places especially since the places I get to see are scheduled a month in advance. Even though I may not be the first one to write about this place I can still feel good knowing that it is still an undiscovered gem to many others. 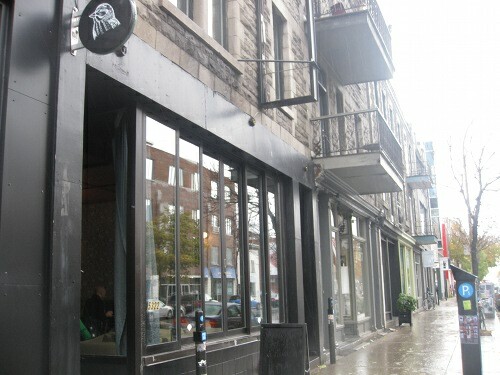 Situated on St Laurent street south of St Viateur, The sparrow stands where the old Mile End bar used to be. Its name takes inspiration from the bird which is not native to North America but rather brought over from England and that is a great way to describe this gem of a place. Originally intended to be a bar with food, the liquor license took a long time to get so upon meeting a chef from England they decided to start focusing on food, and with just a tiny kitchen, have been pumping out amazing food that draws inspiration from England pub style cuisine mixed with Montreal’s unique brunch flair.